Where to go shooting in Arizona! Only $6.50 ea.-- including shipping and handling! Call for wholesale orders, only $36 per dozen! Get 'em for friends or gifts! A project of the TrainMeAZ campaign, this 2-foot-by-3-foot full-color map identifies more than 60 places in Arizona where shooting is legal and officially sanctioned. Indoor and outdoor locations are included. There has never been anything like it, get yours today! A first-of-its-kind “GUN MAP” has been released in Arizona, to inform the public where shooting is legal, for training and safety purposes. The 3-foot-by-2-foot full-color map identifies more than 60 spots in the state where target practice is legally sanctioned and encouraged. The ranges include both indoor and outdoor facilities. Arizona, which has enacted Constitutional Carry, freeing every law-abiding person in the state to bear arms discreetly or openly without government interference, is encouraging everyone to learn how to shoot safely, to practice those skills, and to enjoy the shooting sports. Shooting ranges are where the American tradition of marksmanship is practiced, and contribute to preparedness and economic strength. 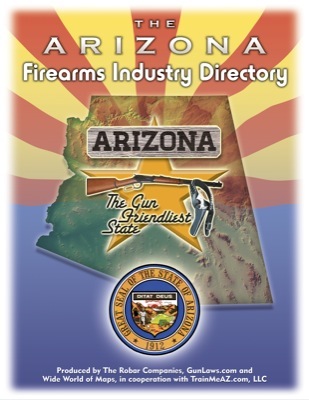 The Arizona GUN MAP has been funded in large part by sponsors of the TrainMeAZ.com campaign. TrainMeAZ is a statewide effort to increase firearms safety by getting all law-abiding citizens to shooting ranges for training, now that government no longer forces people to take classes for discreet carry. It is sponsored by the state’s fairly robust firearms industry. The program itself is widely endorsed (see website for details, and testimonials ranging from state legislators to the CATO Institute). Full-color, large-scale cartography has been done by Wide World of Maps, Inc., the Southwest’s premier map-makers, and includes roads, land ownership, physical features, political boundaries and more. The news media can obtain free sample copies of the Arizona GUN MAP by contacting Wide World of Maps at http://www.maps4u.com, or 602-279-2323. The Arizona GUN MAP "Where to Shoot Guide"
Only $6.50 ea. -- including shipping and handling! is funded in part by the TrainMeAZ.com campaign Contributing Sponsors.